April 17: Free Farmers from Free Trade Agreements! On 17th April 1996, a private militia fires and murders 19 landless peasants in Eldorado do Carajas, Para State, Brazil. Their crime? Occupying fallow land belonging to a rich landowner. This unpunished murder has lingered in the memories of La Via Campesina peasant organisations, and the date now marks the International Day of Peasant Struggles. Breaches of peasant rights, which outrageously happen on a daily basis, are on the rise due to free trade agreements which only serve the interests of multinationals. It is these free trade agreements (FTAs) that secure the position of big private investors with the help of private arbitration courts that act independently of the customs, rules and laws of each country. These investors are the ones that are greedy for land, seeds, water, forests, mineral resources, raw agricultural materials, peasant knowledge and who trigger the race to ever lower incomes for farmers. The FTA that the EU and Mercosur are currently negotiating is one such example. In the name of “free and undistorted competition”, which is non-existent, this free trade agreement seeks to secure large numbers of duty-free imports, such as 100,000 tonnes of beef and 90,000 tonnes of poultry, amongst others. This comes as a heavy blow to us small and medium scale farmers who are already in a dire situation. However, this agreement also facilitates social and environmental dumping, in other words, this is the expansion of the agro-industry to the detriment of peasant communities, with deforestation, monocultures, GMOs and its harmful impact on peasant rights. This agreement, like CETA, TTIP and other EU free trade agreements, is as much of a threat to consumers, given the way in which it violates the precautionary principle and non-tariff barriers, such as food safety norms, whose recognition was a great struggle for civil societies. Peasants around the world are the first to suffer the consequences of “free trade” policies, adjustment variables and bargaining chips used in ongoing negotiations. Today, alongside La Via Campesina, they denounce the mad rush to produce as much as possible for as little as possible. Europe is unable to seriously reform the unfair and illegitimate common agricultural policy, ensure a decent income for those working on the land or protect the environment and the climate. Therefore, it claims to solve these problems through exports. It is high time to denounce this lie and introduce food sovereignty. Free our farmers from free trade!! 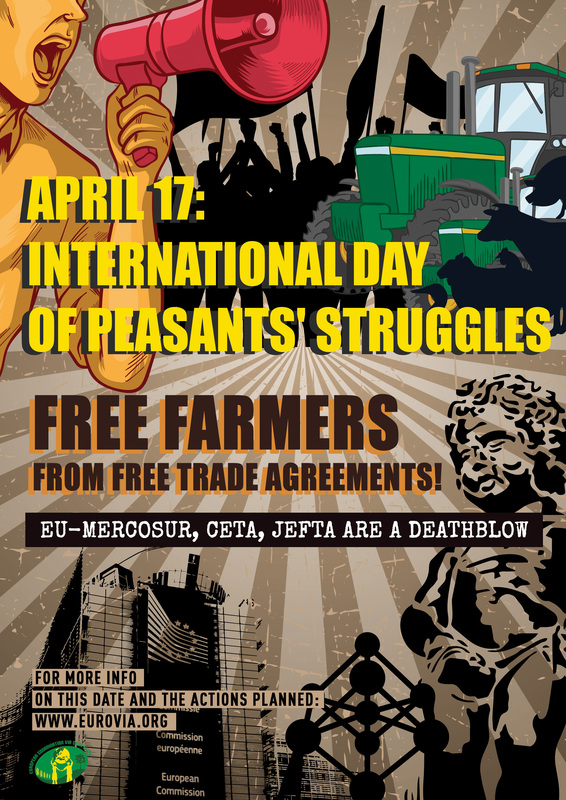 Livestock farmers, peasants, citizens, let us unite in Brussels this Tuesday 17/04 against the EU-Mercosur and other toxic agreements! !